Ideally, I think it would be great to have a default package for every wall and floor so players could choose which walls they'd like to swap out for their own favorite walls/wall sets. Walls I never use are other player's favorite sets. For instance, I never use most Maxis bricks. I'm interested in replacing siding with some of your Wedding Cake sets, Marina's Victorian sets, and HolySimoly's TulipGrove sets. I dislike most Maxis carpet textures too. I would replace most almost all paneling- you are so right about the plastic abominations! I know defaulting them all is a really big job and with some practice, I can help make the packages as I am used to making huge amounts of boring, monotonous files. Completer sets- Maxis hardly ever completed anything, so completer sets will be necessary. Lots of them have already been done by others, so we could seek them out where we can and link to them/host them if necessary before spending time making new ones. I would love our colors to be available for carpet-several textures; paint- with and without crown, base, and chair moldings in all woods; stucco- with and without quoining and moldings; siding- fishscale, shingle, vertical, horizontal, etc. ; paneling- beadboard in all woods and colors, better textures for the maxis panels. I adore the OFB Arts & Crafts paneling, but need it redone for AL ceilings. twilight, inkwash, asparagus, cardinal, toffee, and burntalmond, thistle, pumpkin, takes up to 8. So we need yellow, black, white next - say lemonade, snow, ink next which will bring it up to 11 and cover the colour wheel for choices. I'm not fussed about what order they should be - although maybe ink last. 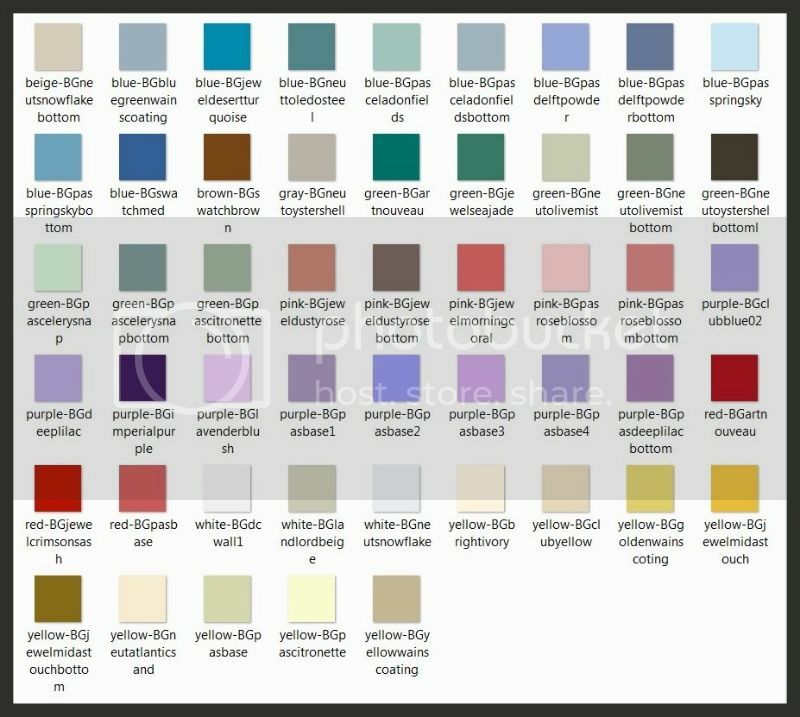 As for the final colours, we could go for some tonal variations and tertiary colours - pink, turquoise, cream, taupe or a cool grey. So maybe - eglantine, aqua or agean, cream, taupe or oyster? It's really up to you, as I'm pretty flexible. As for woods. I like the 4 seasons colours without the fiddly stuff, and 3 quaint also without the fiddly stuff best. IKEA colours are great although I never use them. Pine is lovely idea. Piggi did a lot of those colours, so we could use her textures from a base point-of-view if you prefer - I pretty much have all her maxis colour sets in most everything she did. So that may give you a head start on those extra maxis-match woods. (She did do the seasons, quaint and Ikea colours). (Some of this is just documenting what is actually there for research purposes). (12)Green - celery snap, sage, olive drab, sage advice, latipsoh, jaded green, gutterball green, smitty's green, green means go, deepwood green, atmos lime, awash in autumn. (2)Black - Black is the new Black, Smitty's Grey. Not all of the sets are complete a la EA, but I'm thinking we can either have less colour choices and more complete sets as defaults, or we can have the colour choices (not necessarily in the same colour groupings eg I'd like light grey, dark grey and black at least in the Black group) and complete the sets with completer sets. The more I think about it, the more I think that I prefer the second choice. Set wise, I'm going to do the wallpapers as non-defaults, defaults, AL-ceiling version, non-AL version. So there will be many 1000's of wallpapers by the end. Amy - what bricks do you use? On my site DK has some beautiful brick walls http://www.simthing.net/sims2/s2dk/s2dkbrick01.htm, I have permission to use her textures as I like. AL Friendly moulding is a given. I've got the templates from Spacedoll for that. With the siding, I'll need to match all the choices we make with the M&G build pieces. I have permission from Bibi to do what I like with the wedding cake siding - so that's fine. I'm not sure what Marina's sharing policy is - I'll look for that. I do have permission from Shtinky with the Tulip Grove stuff, so that's ok too. The tulip grove siding isn't complete as I'd like so I'll need to do completer sets for that, and also Marinas. As far as I'm concerned there are 16 parts to a siding set, the EA versions have 3 parts to their set generally. So my plan is to include the rest as completer sets rather than have less colour selections. Quoining for brick and poured is a little more complete with the EA versions, 9 - but again their needs to be more pieces. I prefer to have 2 story versions of the sets as well, which increases the sizes. Panelling for brick and poured has 5 pieces to a set in the EA version. EA sets in paint - they have 3 woods - white, medium, dark wood, and double coffer, coffer, beadboard, double coffered wainscoting, crown-kick-chair rail with another colour, crown-kick, plain, and kick. so 8x3 = 24 pieces to a set. As well, they generally include 2 walls with a kid themed border on plain. As well as those - there are stainless fan wainscoting, framed wainscoting, storybook stencil, streamer border, metal kick and crown, paint with spotlight, and the bold panel set that has a single stripe in different places. There are 14 brick types. Part of the problem with the EA paint category is that it is so higgeldy piggeldy its hard to see what sets are there and what are not. I've actually spent a few days researching the paint category and the brick category in the past. There is actually more method to their madness than is obvious from a quick look. I've already done collections on the EA paints and bricks to work out these sets. Currently, what I'm going to start on - so it's not all just talk - is the paint section. As that's the section that is the most um... definable. I'll investigate the other expansions color sets next, but based on this chart, I think priority 3 needs to be pine, aspen, or spruce instead of asparagus as all the EA greens are blue-based rather than yellow, 7 (purple) should be thistle, 8 (orange) should be pumpkin- goes pretty well with the orange stucco wall, and 9 should be snow, 10 should be lemonade, 11 should be eglantine- pink is used a lot more than deep black, which inkwash stands in for a lot of the time, 12 should be marina (teal-aqua), 13 could be ink, 14 oyster (cool grey), and 15 rootbeer (darker brown). From the brick category, I use the BG London Chimney bricks which match all the NL red bricks, the OFB Black bricks, AL Bohemian, Gearhead, and Socialite bricks, and the UNI brick and metal darkened brick set.